This grilled garlic shrimp in the shell is super delicious and so easy to make. Jumbo or large to medium-large shrimp are grilled in their shells (if you prefer, you can remove the shells). They are marinated in a very quick and easy garlic sauce and then quickly grilled. Makes a perfect appetizer or main course to serve guests — they'll think it took you a lot longer to make! This recipe calls for placing the jumbo shrimp directly onto the grill. If your shrimp are too small and will fall through the grates, you will need to skewer or place on a piece of aluminum foil or banana leaf. Mix the sauce ingredients together in a bowl. Set aside. If grilling shrimp without shells, skip the next 2 steps. To grill the shrimp in their shells, you need to open the shrimp so they lay flat in their shells on the grill. Leaving the shell in place, hold the prawn in your hand so that it curls naturally into your palm. Or hold the prawn on a cutting board. Using a sharp knife, make a cut from the start of the tail (leave tail on), through the middle of the "belly" and down to the head of the prawn. Now turn the prawn over on your cutting board (so that its back is facing up). Use your palm to flatten it out by pressing down gently. When you're done, the prawn should lay fairly flat (don't worry if the shell loosens slightly). Place the prawns in a flat-bottomed bowl or dish. Pour over the garlic sauce. Allow prawns to marinate in the sauce while you warm up the grill. If your prawns are large enough that they won't fall through the grates, place directly on the grill. 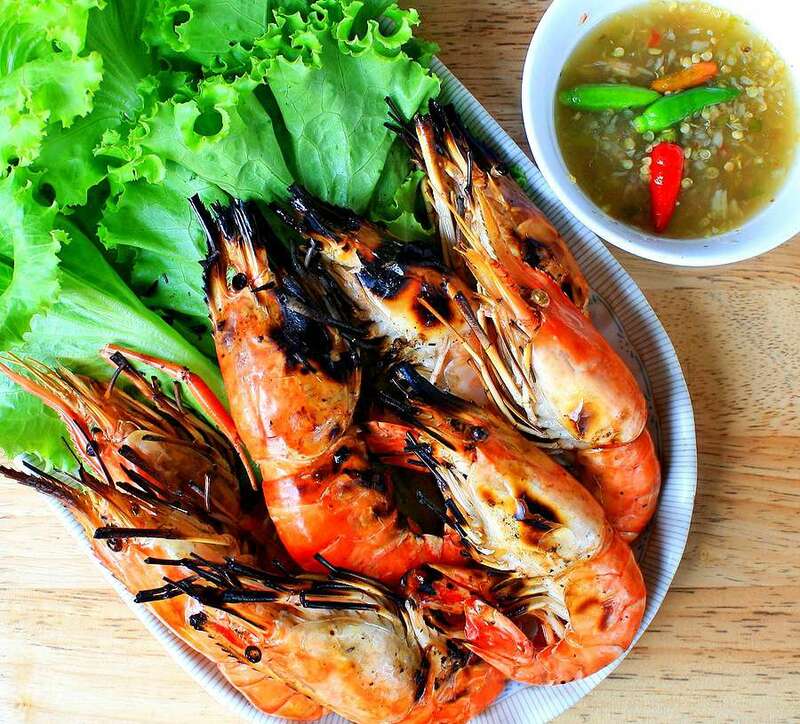 If your prawns are smaller, spread a piece of aluminum foil or banana leaf on the grill first, and then place prawns on top. Or skewer the shrimp with satay sticks (if wood, soak in water first). Baste the prawns the first time you turn them with a little of the leftover sauce. Grill 3 to 5 minutes each side. Prawns are done when the flesh turns from translucent to pinkish-white (and the shells turn a very attractive bright pink). Serve immediately with fresh lime or lemon wedges on the side and a sprinkling of fresh coriander. They are equally excellent on their own or with rice. The shell actually makes them easier to eat and is a nice finger food.